Agra Fort is located (270 10’ 47’’N & 780 1’ 22’’ E) on the right bank of the river Yamuna in the city of Agra in Uttar Pradesh. It is one of the most important and robustly built stronghold of the Mughals, embellished with number of richly decorated buildings encompassing the imposing Mughal style of art and architecture. 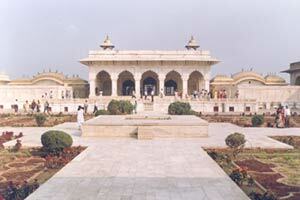 It was constructed by the third Mughal emperor Akbar on the remains of an ancient site known as Badalgarh. Sikandar Lodi (1487-1517) was the first Sultan of Delhi to shift his capital from Delhi to Agra. After Sikandar Lodi who died in 1517, his son Ibrahim Lodi held the fort for 9 years until he was defeated and killed in the battle of Panipat in 1526. Several palaces, wells and a mosque were built in the fort during the Lodi period. When Babur sent his son Humayun to Agra, he captured the fort and seized a vast treasure, which included the world famous ‘Koh-i-noor’ diamond as well. Babur built a baoli (step-wall) here. Humayun was coronated here in 1530. Nazam, a water-carrier (saqqa), who had saved Humayun from drowning, was crowned here as an emperor for half-a-day. 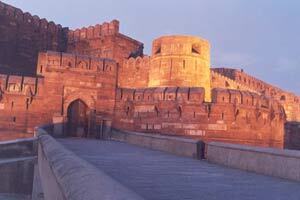 After Humayun’s defeat at Bilgram in 1540, Sher Shah of the Sur dynasty occupied Agra fort and garrisoned it. 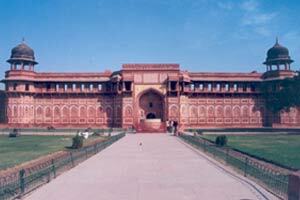 Akbar arrived in Agra in 1558. He ordered to renovate the fort with red sandstone. Some 4000 builders daily worked on it and it was completed in 8 years (1565-1573). The fort, semi-circular on plan, is surrounded by a 21.4 m high fortification wall. Double ramparts have been provided here with broad massive circular bastions at regular intervals. There are four gates on its four sides, one of the gates was called “khizri-gate” (the water gate) which opens to the river front, where ghats (quays) were provided .The fort has survived through the onslaught of time, nature and men. The fort spreads over an area of about 94 acres of land. At present, there exist more than two dozens of monuments in the Fort. Abul Fazl, a court historian of Akbar, records that 5000 buildings were built here beautifully in Bengali and Gujarati style. Most of these buildings have now disappeared. Shah Jahan himself demolished some of these in order to make room for his white marble palaces. Later, the British destroyed most of the buildings for raising barracks. Hardly 30 Mughal buildings have survived on the southeastern side. Of these, the Delhi-Gate, Akbari-Gate and ‘Bengali-Mahal’, are representative of buildings raised during the reign of Akbar. Jahangir mostly resided at Lahore and in Kashmir, though he visited Agra regularly and lived in the fort. Shah Jahan, a great builder, raised white marble palaces here. He also built three white marble mosques in it: Moti-Masjid, Nagina-Masjid and Mina-Masjid. Aurangzeb imprisoned Shah Jahan, his own father, in the fort for 8 years until he died in 1666 and was buried in the Taj Mahal. The barbicans around the two gates and on the riverside were built by Aurangzeb to strengthen its defences. Though Shah Jahan had formally transferred his capital to Delhi, in 1638, he continued to live here. But after his death, Agra lost its grandeur. Aurangzeb remained busy in the regional conflicts and wars. Yet, time and again, he lived here and held the durbar. 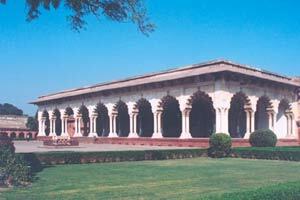 Shivaji came to Agra in 1666 and met Aurangzeb in the Diwan-i-Khas. Aurangzeb died in 1707 and 18th century history of Agra Fort is a saga of sieges and plunder during which it was held by the Jats and the Marathas and finally the British captured it from the latter in 1803. Total Rs.40.00 (Rs.30.00 by ASI as Entry fee and Rs.10.00 by ADA as Toll tax). Total Rs.80/- (Rs.30/- by ASI as Entry fee and Rs.50/-by ADA as Toll tax). Total Rs.550/- (Rs.500/- by ASI as Entry fee and Rs.50/-by ADA as Toll tax). (Note: Foreign Visitors who purchase Agra Development Authority (ADA)’s Pathkar (Toll tax) ticket of Rs.500/- forTajMahal, need not to purchase any other Pathkar(Toll tax) ticket, if he/she visits the monuments viz. TajMahal, Agra Fort, FatehpurSikri, Akbar’s Tomb, Itimad-ud-Daulah’s tomb on the same day) . On Friday ADA does not levy any Toll Tax in monuments. 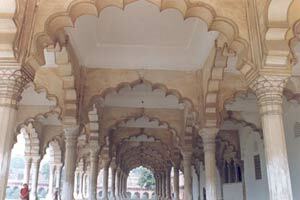 Audio Guides Facility in English, French, Spanish, German, Italian, Hindi and Bangla is available at Agra Fort. Please contact near Ticket Booking counter.